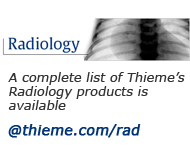 Thieme Medical Publishers, Inc. is the publisher of the RadCases series. Each RadCases title features 100 carefully selected, must-know cases documented with clear, high-quality radiographs. The organization provides maximum ease of use for self-assessment. Each case begins with the clinical presentation on the right-hand page; simply turn the page for imaging findings, differential diagnoses, the definitive diagnosis, essential facts, and more. Each RadCases title includes a scratch-off code that allows 12 months of access to a searchable online database of all 100 cases from the book plus an additional 150 cases in that book’s specialty–250 cases in total!